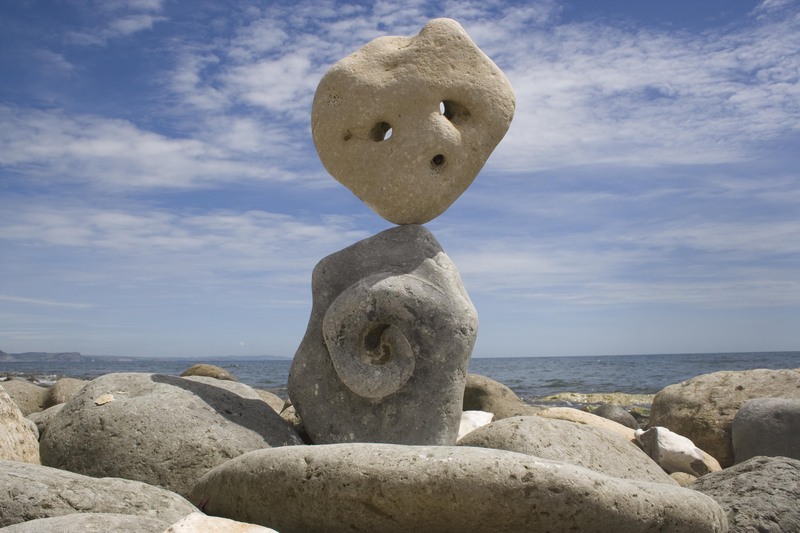 Sarah Day visits the Lyme Regis Fossil Festival and meets local artist Adrian Gray, whose amazing stone balancing sculptures have audiences on the beach enthralled. Like most scientists, faced with the seemingly impossible, my instinct is to work out how it’s done. Looking at artist Adrian Gray’s stone balancing sculptures on the beach at Lyme Regis is an unnerving experience. There are no tricks, no illusions. Just two pieces of Jurassic limestone, together about a metre and a half high, balanced by the smallest possible point of contact. I can’t decide if they’re on the point of falling or floating. Apart from an endless amount of patience, being able to create the sculptures must require an understanding of the stones, which types work best, how heavy they are, what their surfaces are like? ‘You’re still trying to think about the science of it! I’m not thinking about that. Just the aesthetics. When pushed, Adrian does concede that he thinks sedimentary rocks are the best type for his work – but not because of their physical properties. So it really doesn’t matter what type of stone you use? It still feels like watching a magic trick. But, unlike magicians, Adrian does nothing to conceal the mechanics of his performance. The balancing takes around ninety seconds – more for a more complicated piece – during which time he is completely still, holding one stone above the other, making the tiniest adjustments until he lets go and, impossibly, the stone remains in place. Even when you’ve already seen it, each time he topples a stone and starts again it’s hard to believe it will work. 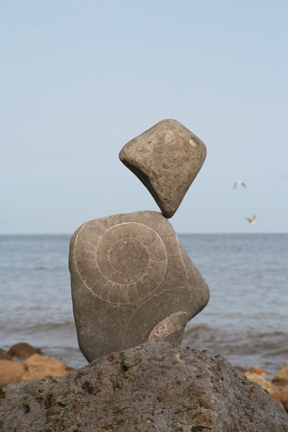 Although stone balancing has become as much performance art as it is sculpture, when Adrian first came across the technique it was whilst creating a sculptural piece. There are three sculptures on the beach now, each somewhere between 1.5 and 2 metres tall, each looking as though a strong gust of wind or too much footfall will topple them. It’s this unlikely solidity which is so mesmerising – that, and watching the act of balancing itself. The stillness and patience required are qualities most of us would like more of, which is probably part of what fascinates his audience. But it is the transparency which keeps us transfixed. It’s the same reason science has the power to stun us – this is not an illusion. It is real life, presented in a way we have never seen before, but so simple to explain that our own world view shifts a little. Tags: activities, art, fossils, geoscientist. Bookmark the permalink. Watching Adrian Gray balance rocks is very serene indeed but it also has that thrill of anticipation. They look so big and sturdy and so incredibly vulnerable at the same time. As I have never seen one up close in person I wonder if it would fall if I touch it.